Substitute Ibisevic beats the offside trap and clips the ball past Romero to set up an exciting finish. Lionel Messi accepts a lay-off from substitute Gonzalo Higuain, runs along the edge of the areas and curls a shot that beats Begovic and goes in off a post. We’re back underway at Maracana and Argentina have made two change, replacing Maxi Rodriguez with Fernando Gago in a bid to bring more structure to the midfield, and bringing in Gonzalo Higuain for Hugo Campagnaro as they revert to a more familiar 4-3-3. An intriguing first half, played out in an electric atmosphere at Maracana, where Argentina fans have taken over and are making a lot of noise. Argentina took an early lead and briefly threatened to overrun Bosnia, but the Bosnians held their own and threatened themselves through Dzeko and Lulic. Argentina have struggled to get the best from the five-man defensive system, a formation rarely used in qualifying but supposedly preferred by Messi. Argentina’s number 10 was forced deeper and deeper to get the ball and has rarely been at his most threatening. The teamsheets are out and, as expected, Argentina are going with a back five, a 5-3-2, with Lionel Messi up front with Sergio Aguero. Bosnia will play their usual shape, 4-2-3-1, with Edin Dzeko as the lone striker. Karim Benzema smashes in his second and France’s third goal of the tournament. From a France corner the ball is laid back to Debushy who lashes in a shot from 30 yards. His effort smacks into a Honduras defender and falls at the feet of Benzema, who hammers the loose ball into the roof of the net from a tight angle. 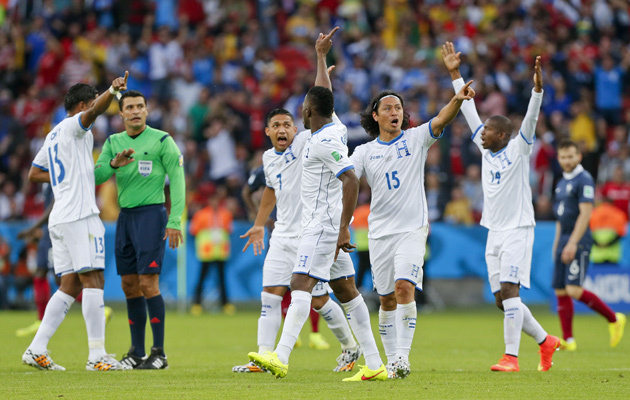 Honduras players complain to the referee about the award of France’s second goal. Honduras coach Luis Suarez is visibly angry with the decision to award the goal. However, the second replay clearly showed that the ball came off the back of Valladares and crossed the line. The confusion arose due to the stadium screen showing Benzema’s initial effort which had not crossed the line. Karim Benzema smacks a volley against the far post, it comes back and hits goalkeeper Valladares on the back, before he scrambles the ball off the line. There’s an appeal and after consulting the new goalline technology, it’s a goal. There’s confusion though as the initial replay shows that the ball does not cross the line, but a second replay confirms it is in fact a goal. That’s a little piece of World Cup history made right there. France 1-0 up against ten men and it is hard to see any way back for Honduras now. Karim Benzema opens the scoring from the penalty spot. Karim Benzema makes no mistake from the penalty sport, sending the goalkeeper the wrong way. Wilson Palacios barges over Paul Pogba in the penalty area. The referee points to the penalty spot and shows Palacios a second yellow card. France midfielder Paul Pogba is lucky to be still on the pitch after he reacts to being trodden on by kicking out at Wilson Palacios. After a lengthy delay, the referee Sandro Ricci shows both players a yellow card. France hit the woodwork again, this time Parice Evra crosses from the left and Antoine Griezmann climbs highest but his header rebounds off the bar. Fantastic piece of athleticism from Honduras goalkeeper, Noel Valladares, to tip the ball on to the bar to deny Blaise Matuidi. After the drama in Brasilia, attention switchs to Porto Alegra where France, Group E favourites, meet Honduras. The teams are in and France have made two changes from the side which thrashed Jamaica 8-0 in their last warm-up game. Amazing climax in Brasilia with Switzerland snatching a last minute winner. Behrami does brilliantly to make a last ditch tackle in his own penalty area before launching a counter-attack which reaches substitute Haris Seferovic, who sweeps the ball into the roof of the net. Switzerland think they have scored when Ricardo Rodriguez scuffs a shot past Alexander Dominguez, but the striker is standing in an offside position. 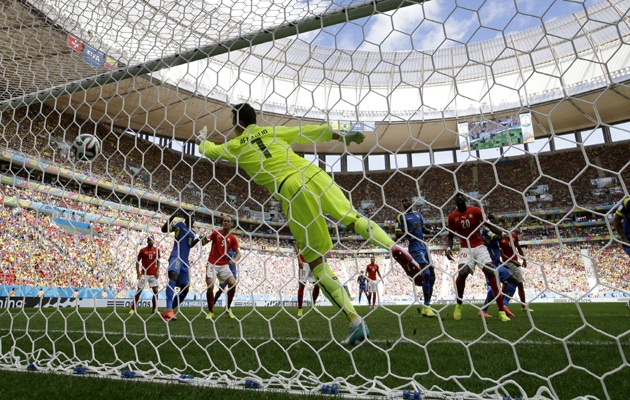 Switzerland are level within three minutes of the restart. A corner is swung over from the left and substitute, Admir Mehmedi, who’s only been on the pitch two minutes, rises highest at the near post to head home. Free-kick near the corner flag is swung in by Walter Ayovi and it’s a teasing cross that Switzerland are unable to deal with, allowing the unmarked Enner Valencia to head in from close range. We’re underway in Brasilia and one can only assume that there are a lot of neutrals in the ground, because the first Mexican Wave has started making its way around the stadium. The teams are in for this afternoon’s Group E match between Switzerland and Ecuador in Brasilia. As for what to expect his afternoon, here are our thoughts on how the teams will play today. Switzerland starting XI: Benaglio, Lichtsteiner, Rodriguez, Von Bergen, Djourou, Inler, Behrami, Shaqiri, Xhaka, Stocker, Drmic. Ecuador starting XI: Dominguez, Paredes, Ayovi, Guagua, Erazo, A. Valencia, Noboa, Gruezo, Montero, Caicedo, E. Valencia. Some more great photos coming out of Brazil. 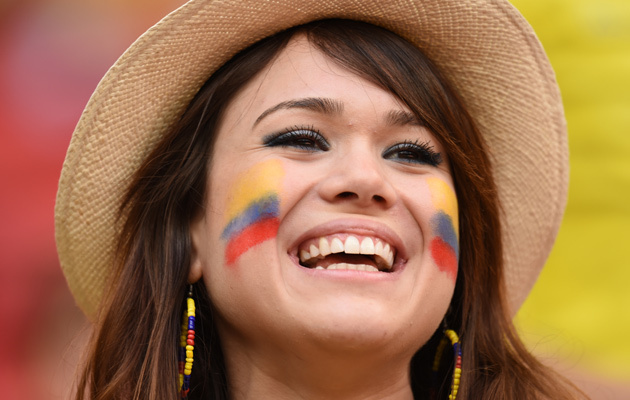 Including this one of some Colombian fans enjoying their team’s win over Greece. 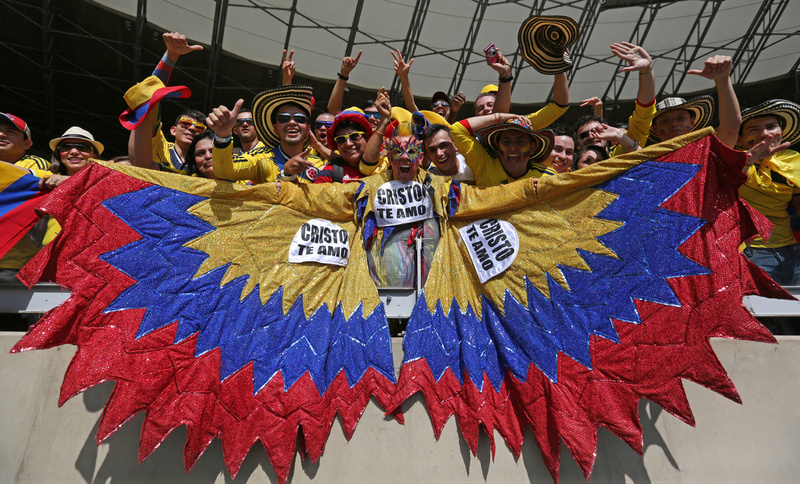 Colombia fans at their match with Greece. First up today is Switzerland-Ecuador in Brasilia. The Swiss, coached by wily old Ottmar Hitzfeld will stick with a 4-2-3-1 system that brought qualification. For Ecuador, the tragic death of Christian Benitez last year was a huge loss on a number of levels. See how they intend to cope without such a versatile performer. You can read our tactical guide to today’s game by clicking here. 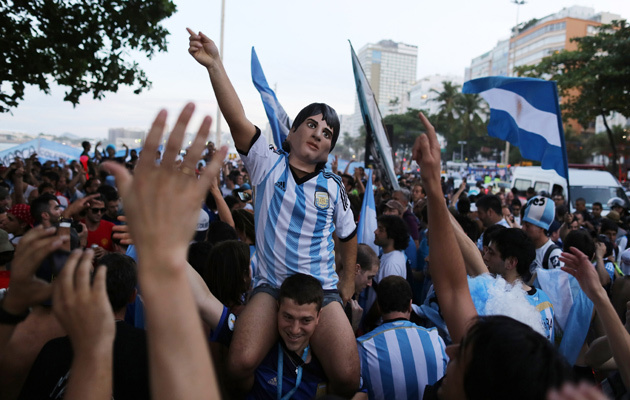 Argentina fans, one of whom is wearing a Lione Messi mask, look forward to their opening World Cup match against Bosnia-Herzegovinia. Lionel Messi makes his Brazil 2014 bow tonight when Argentina face Bosnia-Herzegovinia in the Maracana. Argentina coach Alejandro Sabella discusses his role in bringing out the best in the player generally regarded as the world’s finest. While the England-Italy game began at a high tempo, both sides appeared to struggle physically towards the end, with several England players cramping up. Italy coach Cesare Prandelli believes the players should have been timeouts to ensure they could perform optimally. We’re picking a Goal of the Day throughout the tournament and so far, with 28 goals spread across 8 matches, we’ve been spoiled for choice. Today’s pick is Joel Campbell’s effort from Costa Rica’s stunning 3-1 victory over Uruguay. It was a great finish by Campbell but it was the work of Cristian Gamboa and his refusal to give up a lost cause that made the goal possible. Three more Group matches today, starting with Switzerland’s opener against Ecuador, France’s clash with Honduras and the entrance of Lionel Messi in Argentina’s encounter with Bosnia-Herzegovinia.